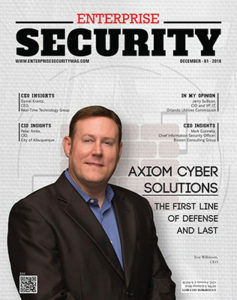 Axiom Cyber Solutions CEO, Troy Wilkinson, and President, Shannon Wilkinson, speak to Fox 5 MORE Las Vegas about small business cyber-security and why Axiom offers unique solutions tailored to give small-to-medium businesses the same level of protection large enterprises enjoy but at a cost they can afford. Industry Era has culminated into one of the most trusted, interactive, community destination for decision makers, C level executives and other high-level IT executives to connect on key issues and business challenges. 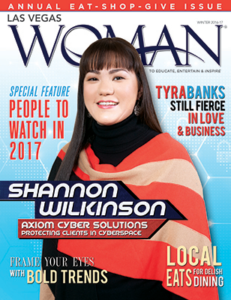 Shannon Wilkinson, the President of Axiom Cyber Solutions, has been featured in the cover story of the Winter 2016 edition of the popular women’s magazine: Las Vegas Woman. “I am a firm believer in the saying “Find a job you love and you will never work another day in your life.” Software Development is my passion and what I love to do. I like finding new solutions to solve old problems and increase effectiveness, growth, and new opportunities through technology,” Shannon says. Axiom Cyber Solutions selected as the 2017 Whippersnapper Family Owned Business Award – South winner by Nevada Business Magazine. Amongst an amazing group of finalists, the following companies took home top honors at the 2017 Family Owned Business Awards. 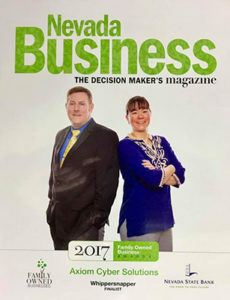 Sponsored by Nevada Business Magazine and Nevada State Bank, the Family Owned Business Awards recognize companies in Nevada for their hard work and dedication. Shannon Wilkinson, the President of Axiom Cyber Solutions, was selected as a Top 100 Women of Las Vegas 2018 & 2017 by MyVegas Magazine. MYVEGAS Magazine polled over 100,000 of our readers to find the 2017 Top 100 Women in Las Vegas. These women come highly recommended by our readers and our community! 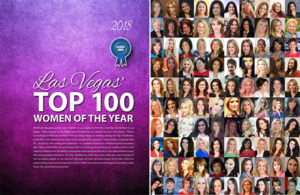 There’s no shortage of fabulous females in the Las Vegas Valley, so ranking among the Top 100 Women of the Year is an extraordinary honor and sought-after accolade. These women truly give their all – sacrificing time, energy and resources – to positively impact our community each and every day. Here at MYVEGAS, we are blessed with the privilege of providing our readers with fun and inspiring content, and the ability to recognize some stand-out women in this special feature issue. 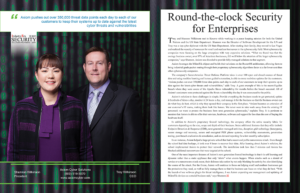 Shannon Wilkinson, the President of Axiom Cyber Solutions, was selected as the Las Vegas Women in Technology – Cybersecurity 2018 and High Tech Woman “Entrepreneur” 2017. The Las Vegas Women in Technology Awards recognize the women working in and changing the face of the technology community in Las Vegas. The awards encompass the various sectors of technology as a whole to recognize and promote the advancement of women in technological careers. Five awards are given: High Tech Woman of the Year, High Tech Rising Star, High Tech Community Service, High Tech Entrepreneur and High Tech Mentor. Equifax hack: How bad could it affect Nevada citizens, recovering economy? Banking bombshell: Are Las Vegas companies safe from hackers?